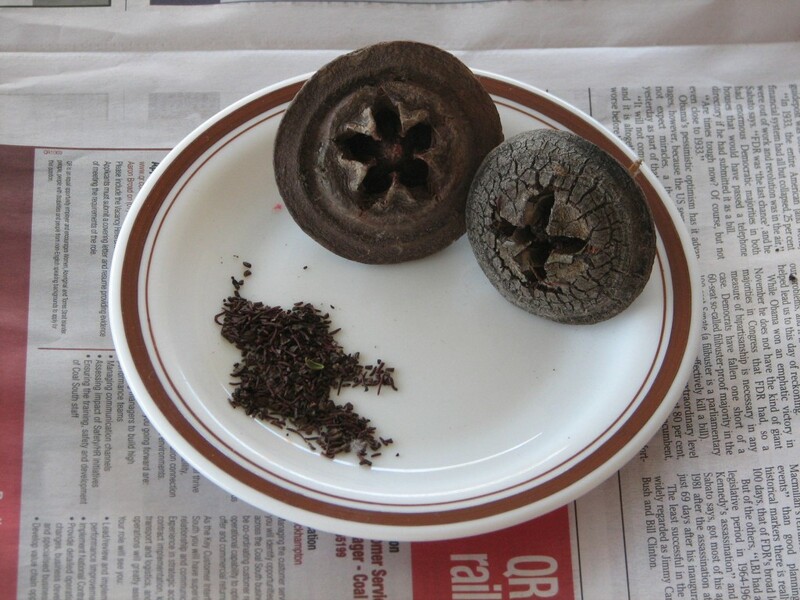 The Eucalyptus gum nuts (woody fruits) that are left on the tree after it has flowered, contain seed and chaff. When they have ripened some fall off naturally, or are nipped off by parrots and lorikeets. 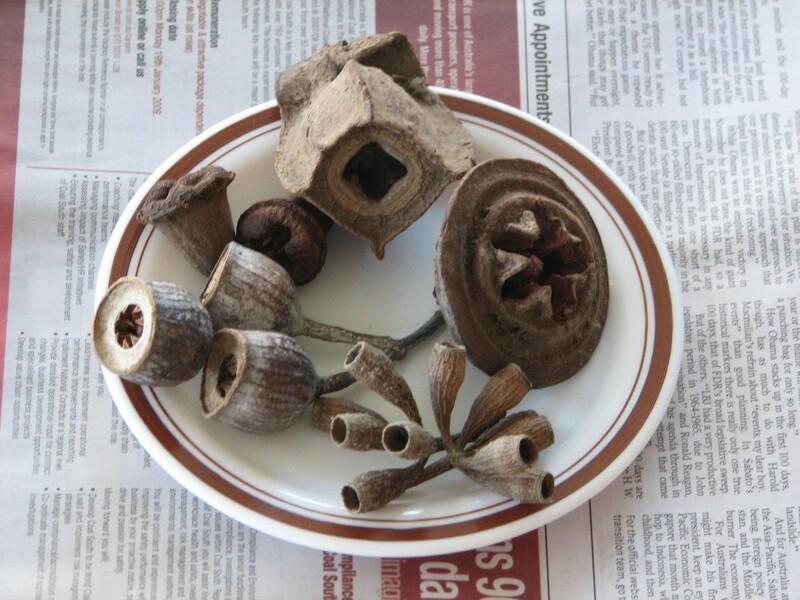 These gum nuts can be collected and placed in a container or paper bag and left in a dry place until the valves in the top of the nut open and release the seed and chaff. Some trees hold the nuts way past the first year. It is always best to take the older nuts as then you will be sure that the seed is mature and will germinate. Some species of Eucalypt do not set much seed in the nuts, and some seed will not germinate. 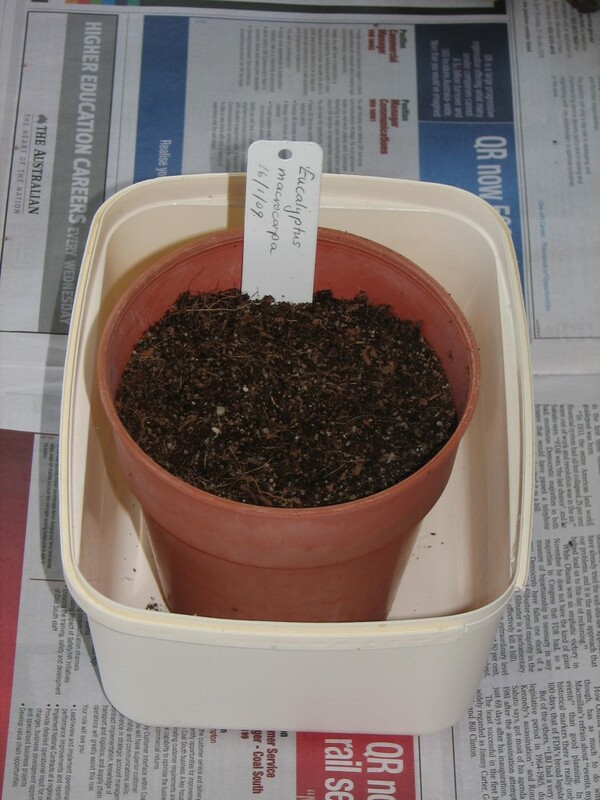 Use a clean pot, about 100-150 mm across the top, with holes in the bottom. You can buy seed raising mix from garden centres and some large supermarkets. It keeps, so just store it in a clean container, with a lid. You can make your own with clean (washed) coarse sand and cocopeat. The cocopeat is available from garden centres and supermarkets. The block is the size of a house brick and is made from coconut husks. Half fill a 9 litre bucket with water, place the cocopeat brick in the water and leave it to absorb the water and expand and become moist and crumbly. Use about two parts peat and one part sand mixed together. Fill the pot to within 2 cm of the top of the pot and tap the pot on the table to settle the mix. Press the surface of the mix lightly to make it smooth. Sprinkle a pinch of the seed/chaff over the surface of the mix. Sprinkle a very light layer of the seed raising mix over the seed. 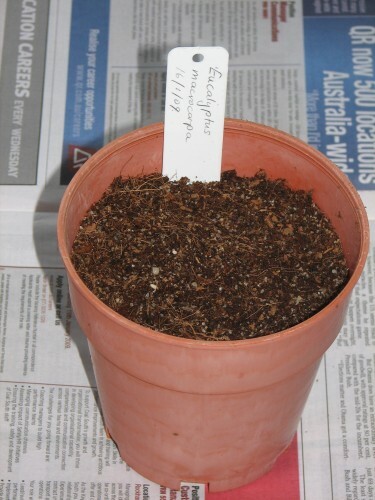 Label the pot with the name of the species and the date. Labels can be made from the lid of an icecream container, or pop sticks. Stand the pot in a container like an icecream container and fill the ice cream container with water. The water will soak up through the seed raising mix and wet the surface of the mix and the seeds. The surface of the mix should be kept moist, not soggy, so once the moisture is there, keep the water level in the ice cream container at about 3cm. Keep the pot in a sheltered, well lit spot, out of direct sun if the weather is hot. Seed should begin to germinate in 2-4 weeks, depending on the air temperature. When the seed has germinated, keep the water level in the icecream container quite low, or remove it altogether, keeping the potting mix just moist.